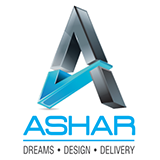 Engaged into construction activities since 1992, Ashar Group is a renowned name in Thane, making it its forte and nurturing it with excellent landmarks. The last 9 years saw a huge real estate revolution in these areas as this renowned group got passionately engaged in the realm of construction under the name of 'ASHAR'. Under the mighty leadership of Ajay Ashar, the Chairperson and Managing Director of Ashar Group, the company has maintained its position as one of the major influentials in changing the city's skyline with impressive constructions.